A JOURNALIST FOR the Irish Times has told the Disclosures Tribunal that he would remember being given a negative briefing by Superintendent Dave Taylor about Maurice McCabe and such an event “didn’t happen”. 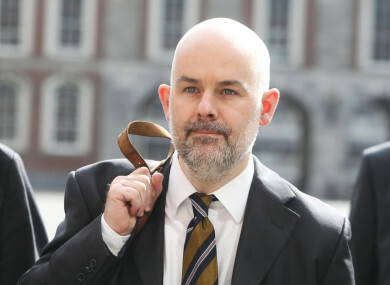 Conor Lally was giving evidence for a second day at Dublin Castle, as the Tribunal continues to look into claims from former garda press officer Taylor that he briefed the media negatively about McCabe on the orders of then-garda commissioner Martin Callinan. Taylor has given the names of a number of journalists he said he smeared McCabe to, and Lally is amongst him. The superintendent was not able to give times, dates and locations where he told journalists such things though. Lally, however, has denied this and said no one in An Garda Síochána ever tried to smear Maurice McCabe to him. It was Taylor’s assertion that Lally was the only journalist to “push back” on what he was saying about McCabe but that was rejected by the Irish Times journalist. Today, Lally called Taylor’s account “a total fantasy”. He can’t say where it happened, when it happened… He has absolutely no evidence whatsoever. It just didn’t happen… Taylor has put in a protected disclosure that led to the creation of the Tribunal and he can’t remember any of this. Lally was also asked a number of times about when he first heard about Maurice McCabe and the allegations against him. He said he was first given information about McCabe at a time he believed to be around 2011. He told the Tribunal that the person told him that McCabe was blowing the whistle because he had fallen out with the gardaí over the 2006 allegation of sexual abuse against him. Lally also said that there was a degree of talk about McCabe among journalists in 2014 then, when McCabe had come to public prominence. He said he found it very hard to recall specific instances where he talked to journalists about it, or heard it from others. After Lally, Irish Mail on Sunday journalist Debbie McCann began her evidence. We’ve already heard evidence from a colleague of Debbie McCann: Alison O’Reilly. O’Reilly has said that McCann told her that Maurice McCabe was a child abuser, and that she had been given this info by Superintendent Dave Taylor and Nóirín O’Sullivan. McCann also went to try to interview Ms D – the woman who made the 2006 allegation of sexual abuse against Maurice McCabe. She is expected to refute O’Reilly’s claims but, in her evidence so far today, McCann said she couldn’t answer a number of questions put to her about information she’d been given for “source protection reasons”. This led to a number of testy exchanges with counsel for the Tribunal and McCann. McCann did tell the Tribunal, however, that no one in An Garda Síochána smeared Maurice McCabe to her. She will continue giving evidence this afternoon. Email “'A total fantasy': Irish Times journalist dismisses Taylor's account of smear campaign”. Feedback on “'A total fantasy': Irish Times journalist dismisses Taylor's account of smear campaign”.